A soldier from the 33rd Infantry Division uses an M2 flamethrower. 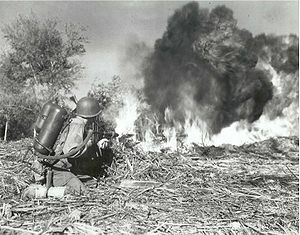 The M2 flamethrower was an American man-portable backpack flamethrower that was used in World War II. It was the successor to the M1 and M1A1 flamethrowers. Although its burn time was only around 7 seconds and the flame was only effective out to around 20–40 meters, it was still a useful weapon. However, with the arrival of flamethrower tanks, the need for flamethrower-carrying infantrymen to expose themselves to enemy fire was greatly reduced. Though some M2s were sold off, the majority were scrapped when they were declared obsolete. The M2 was the WWII model had hexagonal gas caps and hourglass frames. It was also called the M2-2, M2 for the tank groups and -2 for the wand type. The M2A1-2 is the variation of the M2 devised during the Korean War. These had straight sided backpack frames, vented gas caps, a cylinder sized regulator and a safety valve. These are much more common today than WWII models. M2A1-7 was a flamethrower used by the American troops during the Vietnam War. It is the updated version of the M2A1-2 unit used during The Korean War. Back of the rear grip: firing safety catch. Front of the rear grip: firing trigger. Under the front part: igniter trigger. The M9A1-7 is the most common model used in Vietnam and is much lighter and easier to use. Tanks for this weapon are commonly found, but most wands were destroyed after the Vietnam war. Some U.S. Army flamethrowers have a front handgrip with the same shape as the rear handgrip. In these models the igniter controls are on the front handgrip, arranged in the same way as the rear handgrip controls. The M2 was replaced by the M9A1-7 flamethrower which was used in Vietnam. The M9A1-7 was replaced by the M202A1 FLASH. Two CGI views of a man with an M2A1-7 U.S. Army flamethrower. The two big tanks contain the fuel. The small tank contains the pressurizing gas (nitrogen). M2A1 flamethrower used by the Chinese soldiers in CBI Battlefield. ^ "Flamethrowers. Hated feared and used by all". diggerhistory.info. Retrieved 22 November 2015. ^ "携帯放射機（火焔放射機）" (in Japanese). Retrieved 22 November 2015. This page was last edited on 16 March 2019, at 23:50 (UTC).